Why journalists should build an online presence. I took part in an interesting discussion at the National Union of Journalists’ Oxford branch last week on why and how journalists can build an online presence. I’ve often noted that there’s a wide range of views about the world of ‘online’ when a group of journalists are in a room. Having attended several training and networking events with fellow union members over the last few years, I’ve observed a definite divide between those who panic at the changes to the industry brought about by technology and those who embrace these new opportunities. I’ve always looked for chances to try new things so I’ve been immersed in web publishing for a long time; I’m now something of an evangelist for getting involved. So here are my five reasons why journalists should be online. We are in the business of communication. We should not ignore new communications channels. Your website or blog gives you a public portfolio, and makes it easy to showcase your writing skills or specialist knowledge. We should be good at this stuff. Some people are intimidated by the 140-character limit on Twitter: as writers and editors, this is the sort of thing we know how to do. Twitter is the new contacts book. As a medium for networking and information sharing, it can supplement (if not replace) the notebook of names that is the traditional tool of the reporter. There are some quick and easy ways in. The free blogging platform WordPress.com is a good starting point (it’s what branch member Kate Griffin used for the new branch website). 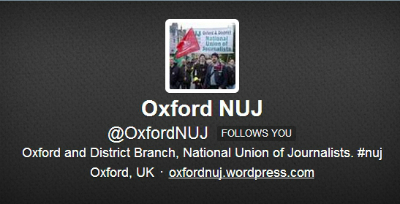 Social media is even quicker: I set up a branch Twitter account in five minutes during Thursday night’s meeting. For a journalist, being online is becoming a necessity. But it’s also useful, it’s often fun, and it could open up new possibilities.